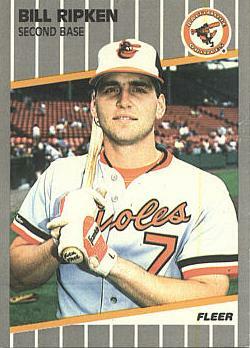 Fleer's 1989 baseball card of Billy Ripken of the Baltimore Orioles had an unusual feature: an obscenity on the handle of his bat. For years Ripken blamed a playful teammate for scribbling the naughty message on his bat just before the photo was taken. In 2009 Ripken fessed up, saying he had written the message on his batting practice bat to distinguish it from his game bats. He had just finished taking BP at Fenway Park when the Fleer photographer snapped this photo. When this error became public knowledge, Fleer reissued Ripken's card several different times, with the offending message blacked out or obscured in a different manner. Predictably, the original 'error card' is much in demand by collectors.